Every Christmas Season, our family has an advent calendar that we open each day in the lead up to Christmas. We started it when the kids were small to help us in our focus on Jesus in this busy commercialised season. Over the years, we have added various other advent calendars – chocolate, lego creating, stickers, Jesse Tree, ‘Truth in the Tinsel’, Bible verse, reading a Christmas book each day etc. Last year we decided that we would forgo the chocolate advent calendar and make up an ‘acts of kindness’ calendar instead. Part of my intention was to combat entitlement with gratitude and giving. Last year we started our acts of kindness advent calendar early as both “Share the Dignity” and packages for the Defence Force Personnel serving overseas had a deadline before the beginning of December. 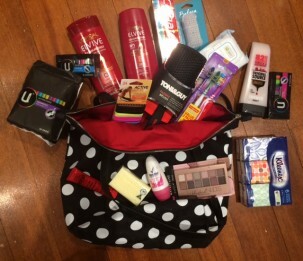 For “Share the Dignity”, we bought a bag and filled it with toiletries which we then gave to the organisation (www.sharethedignity.com.au/christmas-charity) who distributed them to victims of domestic violence at Christmas. You then drop the filled bags to any Bunnings store. Tying a yellow ribbon to the handle meant that the bag was especially suited to a teenage girl escaping an abusive situation. This particularly suited Princess (15) who spends a lot of time scouring the toiletry/make-up aisle in the supermarket. This year the cut-off date is December 2nd. 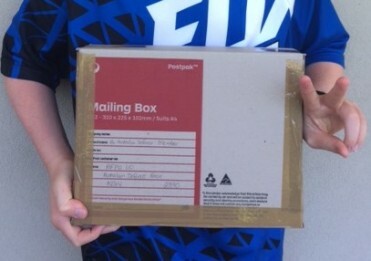 Matey is currently aiming to join the Defence Force when he graduates from school so last year we bought a box from the Post Office (BX2 which costs $2.40) and filled it with items to send to a Defence Force member serving in the Middle East. Matey chose a puzzle book, magazine, disposable razors, cashew nuts, lollies, small Christmas pudding, socks, tinned food etc and also included a letter and stamped self addressed envelope. The details can be found on the Defence Force website. As long as the total package weighs under 2kg, there is free postage. You just need to fill in a customs declaration form at the Post Office which states what is inside. This year you need to post it before November 30th. The list of what to include and what not to include can be found here, as well as the postal address: https://www.timmander.com.au/docs_users/112/CarePackagestoTroops.pdf As the Defence Force received too many packages last year, if you write “If this parcel is surplus, please donate to V360 Australia, c/o PO Box 194, Dianella, WA, 6059”, then the package will go to a homeless ex war veteran here in Australia. Already this year I have had Matey (nearly 13) suggesting multiple ways of helping others. His boxing class is making up a hamper for struggling families and it was fun grocery shopping with Matey for items. Part of his purchase was a really nice and healthy breakfast cereal. We then had to buy long life milk to go with this. Coffee, tea, cans of baked beans, biscuits and chocolates plus socks were all included. In future I think I will have to put a financial limit on the amount he wants to spend. On the other hand, I am grateful that he has such a generous heart. I believe it has far more impact when we take our children shopping to select the items rather than just throw an extra item in the shopping trolley when we do our shopping. Our kids need to be involved in the whole process. Matey can’t wait until tomorrow when we are going shopping for the Defence Force Personnel parcel. My aim is to be more others focused and Jesus focused in this lead up to Christmas. Thus, we have made up and printed off the 2018 Acts of Kindness Advent Calendar and are looking forward each day to focusing on how we can help others. 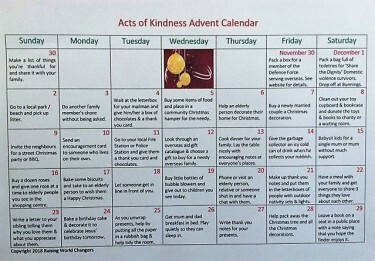 I have attached a pdf copy below of our “Acts of Kindness” Advent Calendar which you are welcome to adjust to suit your family. Since we home educate, we have the flexibility throughout the weekday to go to the shops as well. I encourage you as a family this Christmas to think outside the box and find some new ways of showing kindness this Christmas. Perhaps have a special family meal and brainstorm different ways you could do this. I would love to hear your ideas.